In order to get the job I wanted it was written into my contract that I had to get my drivers licence by the end of January, giving me around three months to learn with no previous experience. 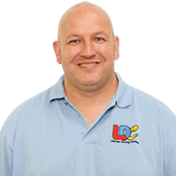 I chose to learn with Chris because I saw how many people has succeeded with him, and I really liked the LD system where I could watch the video tutorials and use the workbook in between lessons. It didn't take long for me to relax and Chris's sense of humour kept me from getting too nervous, and whenever I made mistakes we went though it together so that I learnt from them. I definitely felt the pressure of having such a tight deadline but Chris understood that and made enough time for me, working with both of our busy schedules, meaning that I passed first time just a couple of days before Christmas! 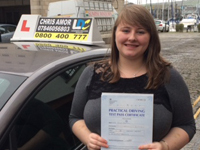 I now feel safe and confident on the road and would definitely recommend Chris to anyone.